Campaigning for Iran's presidential election began last Friday, the day after the Guardian Council, the powerful body that vets candidates for Iranian elections, narrowed the field from over 1,600 hopefuls to six finalists. Incumbent President Hassan Rouhani, the odds-on favorite to win the May 19 vote, made the cut, along with his ally and first vice president, Eshaq Jahangiri, and reformist politician Mostafa Hashemitaba. Veteran hardliner and former Culture Minister Mostafa Mirsalim was also approved, as was conservative Tehran Mayor Mohammad Bagher Ghalibaf. Ebrahim Raisi is also in the running. Raisi–head of Iran's wealthiest and arguably most powerful institution, the Astan-e Qods Razavi organization–is Rouhani's main challenger and a leading contender to be the next supreme leader. But the story of Iran's presidential race that captured the most Western headlines in recent days involves someone no longer in the running: Mahmoud Ahmadinejad, and his brief return to the spotlight, which helps explain how the regime's internal differences can affect the election. The firebrand former Iranian president, who served from 2005 to 2013, surprised observers on April 12 by announcing he would run in the upcoming election, despite the objections of Supreme Leader Ayatollah Ali Khamenei. Ahmadinejad became notorious as president for his belligerent statements about Israel, questioning of the Holocaust, and efforts to ramp up Iran's nuclear program. He made several speeches last year that prompted speculation of another presidential run. But in September, Khamenei, who has the final say in virtually all matters of state, told Ahmadinejad not to run, warning a presidential bid would "create bipolar opposites and divisions in the country." Nonetheless, the former president defied Khamenei and announced his candidacy, only to have the Guardian Council dismiss him last Thursday. All 12 members of the council are appointed either directly or indirectly by the supreme leader. Why would Ahmadinejad run for president? First, he has been out of the public eye since leaving office and wants to be relevant again. Ahmadinejad is a populist still liked by many working-class Iranians and those disgruntled with the country's major city centers; he may have seen an opportunity with citizens unhappy about not seeing the expected benefits from post-nuclear deal sanctions relief. Furthermore, he and his top aides are still facing open legal cases for financial corruption, which will further sully Ahmadinejad's already damaged reputation. There may not be another chance for him to serve in government. Ahmadinejad could have been trying to bolster the candidacy of his former vice president, Hamid Reza Baghaei, who also was disqualified. Ahmadinejad announced months ago his backing of Baghaei and may have been seeking leverage for his ally in case he was barred. Another factor is an effort to publicly challenge Khamenei, who had public rifts with Ahmadinejad during his presidency. Ahmadinejad is a second-generation revolutionary who appears less committed to the Islamic Republic's core foundation: velayat-e faqih, or guardianship of the jurist, the concept of an Islamic system of clerical rule that gives the supreme leader ultimate political and spiritual authority until the Twelfth Imam returns as a messiah figure. Ahmadinejad may be more likely to defy Khamenei than those who served in the early years after the 1979 revolution. Ahmadinejad's dismissal indicates at least one reason why the supreme leader would be more comfortable with Rouhani as president: he is a regime loyalist who, despite "reformist" labels from Western elites, is committed to Khamenei's fundamental authority and vision. Rouhani is a product of the Iranian revolution and wants to ensure the regime's survival above all else. And while Khamenei's allies are excoriating him over failed promises from the nuclear deal, the agreement could not have come to fruition without the supreme leader's approval. Moreover, Rouhani is a known quantity who has been less trouble for Khamenei than past presidents, including Mohammad Khatami, who had a greater reform platform. Other candidates meet these criteria, but there are more tangible reasons why Khamenei would desire Rouhani's reelection. 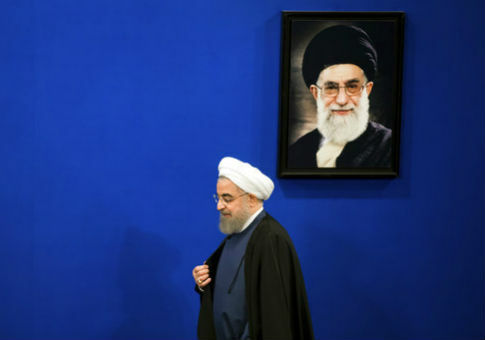 "One is that Iranian presidents tend to become much weaker in their second terms, with a key cause being their greater susceptibility to control by the supreme leader and his institutions," Iran expert Mehdi Khalaji recently wrote. "This helps explain Khamenei's possible abstention from active support for the hardline candidates." Khamenei's lack of active support is one reason why there is no hardline opponent who appears capable of unifying the anti-Rouhani camp, giving the incumbent an electoral advantage. Only two Iranian presidents have failed to win reelection since the Islamic Republic's founding. The supreme leader may also want to avoid unwanted escalation with the United States. Iran is still waiting to see what the Trump administration's approach to the Middle East will be and wants to avoid more sanctions blocking economic recovery. The regime also does not want to provoke a military confrontation with Washington anytime soon, despite what bombastic rhetoric from Tehran may suggest. In 2013, Rouhani only won a slim majority of the vote, 50.88 percent, and while he is credited with the nuclear deal, many Iranians are upset they have not experienced the economic benefits they were promised. Still, no one seems poised to defeat the incumbent, but an upset victory is possible. The candidate with the best chance seems to be Raisi, a close Khamenei ally and member of the Assembly of Experts, the body charged with choosing Iran's next supreme leader. (Rouhani is also a member.) Last March, Raisi was appointed custodian of the Imam Reza Shrine, the Muslim world's largest charitable foundation, with an estimated $15 billion in assets as of 2004. Raisi had worked his way up through the judiciary after the 1979 revolution and was part of the 1988 "death committee" that sanctioned the killings of thousands of political prisoners. The Islamic Republic's founder and first supreme leader, Ayatollah Ruhollah Khomeini, had ordered the secret executions, which resulted in about 4,500 murders over a two-month period. Raisi actively supported the purge. Beyond hardliner disunity, Raisi's biggest setback is his judiciary and intelligence background, which Khalaji noted has not boded well for presidential hopefuls. Justice Minister Mostafa Pourmohammadi, for example, a former deputy at the Ministry of Intelligence and fellow member of the "death committee," pulled out of the 2013 election because of low support. The real issue is that Raisi is a leading contender to succeed Khamenei–perhaps the leading candidate because of his close ties to the Islamic Revolutionary Guard Corps, which will have a say in the succession process, and other security services in Iran. This makes up for his lack of clerical credentials compared to other potential candidates. But an election loss in May for Raisi will surely eliminate his chance of becoming supreme leader and lessen his influence on the succession altogether. Could Raisi withdraw his name before the election? It remains to be seen. He seems to be Khamenei's preferred choice for succession, but the supreme leader cares about his position having legitimacy and unequaled authority. A presidential election loss could sully Raisi's credentials to meet such standards. A fixed or fraudulent vote is possible to ensure Raisi's victory, as many suspect occurred with Ahmadinejad's reelection in 2009, which triggered the violently suppressed Green Revolution. But Khamenei does not want a repeat of 2009 and would take a Rouhani presidency over mass uprisings any day. This issue is especially pressing because the presidential race, while important, is far less significant than the looming succession for supreme leader. Khamenei is 78 and could die in the next few years. The president's power is quite limited, even over executive matters, and whoever is elected will not be able to change the regime's decision-making process. More importantly for the United States, the president will have no authority over Iran's foreign, defense, and nuclear policies, which are what pose the greatest threats to American interests. These areas are completely under the supreme leader's purview–and his allies in the security and intelligence services. Regardless of what happens on May 19, there is little reason to believe Iran will alter its core beliefs and anti-Western outlook anytime soon. One can hope for and even work toward that goal, but expecting otherwise, even in the medium- or long-term, is a recipe for dangerous policy prescriptions. This entry was posted in National Security and tagged Ali Khamenei, Hassan Rouhani, Iran. Bookmark the permalink.